I learned a few lessons — the hard way — while building this New Carolina Windom. At risk of making myself look like an idiot I’ll share some of them with you here so that you can learn from my mistakes. You might wonder how a guy who has been a ham for 33 years could be so ignorant about some of these things, but understand that up until this project I had never even put up an outdoor antenna on my own. My dad was the one who did all this when I was a kid. 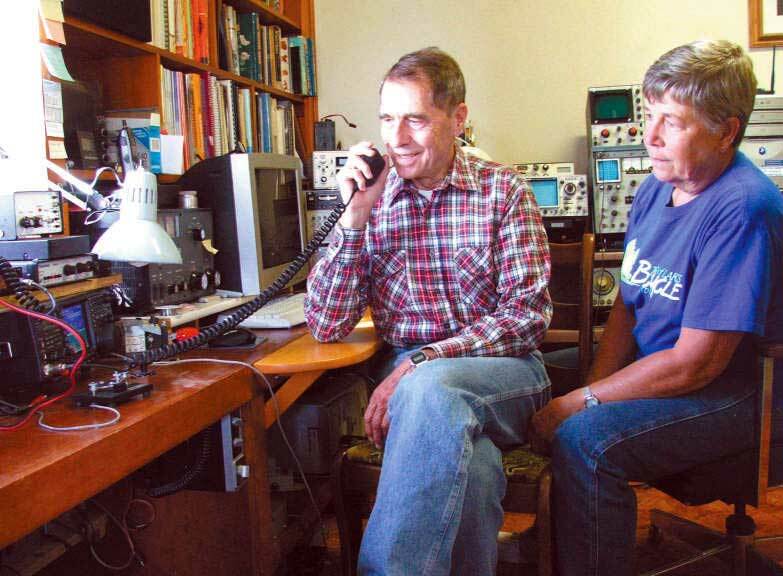 When I became a homeowner, all my antennas were indoor, stealthy antennas located in my attic — a whole different ballgame. That doesn’t work in my current house, so for the first time I’ve had to build up an outdoor antenna-system. Drilling holes in masts: Use a titanium bit. It’s worth the money! I used lesser bits at first, to my frustration. Titanium bits cut through aluminum like a hot knife through soft butter, and they make short work of steel, too. If you’re drilling anywhere but in a workshop, make sure you put down newspaper or something to catch the metal shavings; metal shavings do not contribute to a “barefoot lawn!” Also, build a good jig if you’re drilling all the way through the mast. The jig I built did a good job of holding the mast in place but next time I’ll improve it with a guide that ensures top-dead-center and (in lieu of a drill-press) perfectly perpendicular drilling. 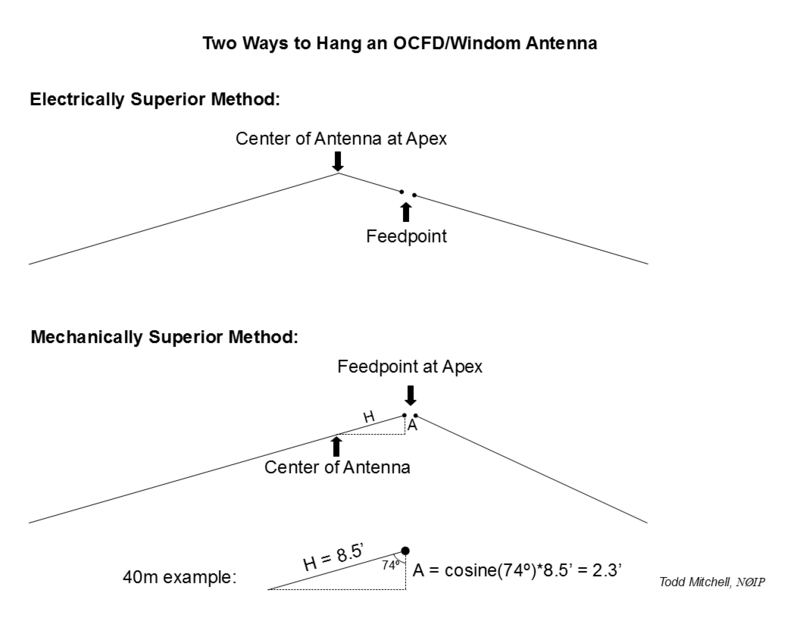 Cutting & handling antenna wire: Be generous when cutting the legs of your antenna. I thought I was generous, but when it came time to make my final adjustment (after SWR testing) I could have used just a few more inches than the extra 15″ I had allowed myself on the long leg of my New Carolina Windom. And when handling 14 AWG copperweld, watch out for kinks! As hard as I tried, I came mighty close more than once to putting a bad kink in that unwieldy stuff. Erecting masts: Use a level to make sure the mast is vertical. I know, DUH! I did use a level when I put the tripods up, but when it came time to put the masts in I had forgotten to bring it up on the roof with me. It was just too tempting to pop them in without checking to see that they were perfectly vertical. I found out the hard way that a mast can be tilted quite a bit and still look perfect when peering up its length! 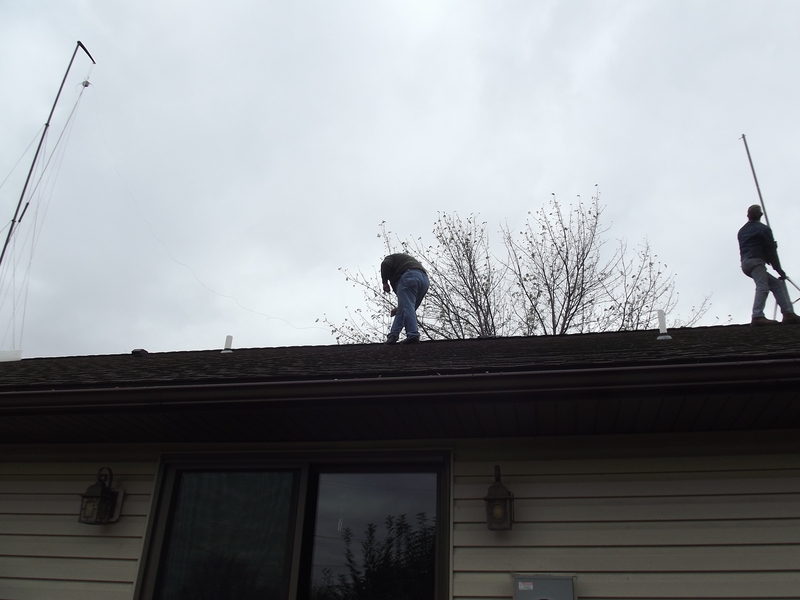 Working safely on the roof: Use a safety-line. The first time I went up on my roof I was surprised at how much steeper it was than the one I used to scramble around as a kid. Frankly I was scared stiff up there, especially with this bum leg of mine. I’ve heard there are safety harnesses out there, but I couldn’t find one. So what I did was to throw a safety-line over the roof and tie it off to something stout. That at least gave me some added security on the side of the roof opposite the attach-point. Just make sure your rope is strong and your knots are good! Soldering wire on the roof: Buy or borrow a butane soldering iron. I found out the hard way that even a 100 watt soldering gun is useless at the end of a long extension cord. It worked fine for soldering lugs onto the end of my 14 AWG copperweld, but not for soldering the same wire twisted onto itself. And a regular propane torch is definitely not the right tool for the job (I know, I tried!). Also, you might want a drop-cloth up there. 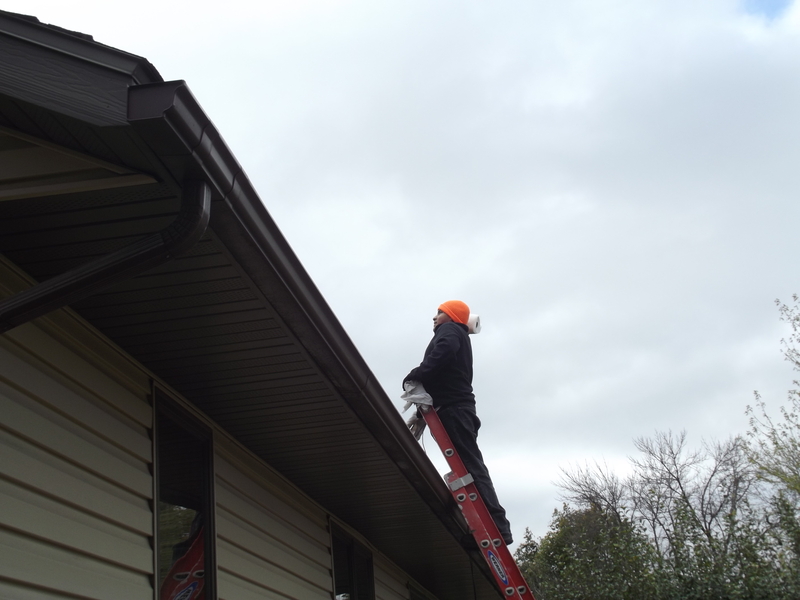 By the time I was done with the job using a propane torch (you should have seen it — it was pretty comical), I had more than one solder-drip on the shingles. Waterproofing coaxial connectors: Use coax-seal or self-amalgamating tape. As I mentioned in my earlier post on this subject, I at first just used electrical tape to wrap my coaxial connectors. After being persuaded by several kind hams who posted comments on that post, I ordered some coax-seal. It’s a good thing I did; I am grateful to those hams for their good advice. When the shipment arrived, I went up on the roof to discover one of my nice pretty tape-jobs already coming apart at the seams after less than two weeks! By the way I found out that five feet of 1/2″ coax-seal is good for only three connections, at least the way I wrapped them. Allowing for radials: Build in an attach-point for radials at the base of your RF choke if you’re building a New Carolina Windom. Only after my antenna was complete did I read about the benefits of adding radials to this antenna. 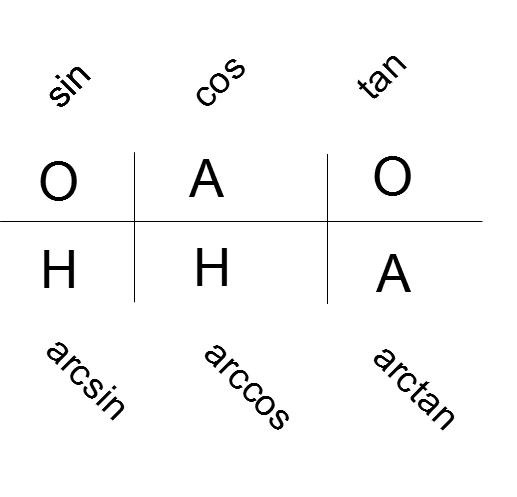 There is no good way that I can think of for me to connect radials directly to the coaxial connection. Next time I build an RF choke I’ll provide some lugs (or a plate or something) on one end for this purpose. 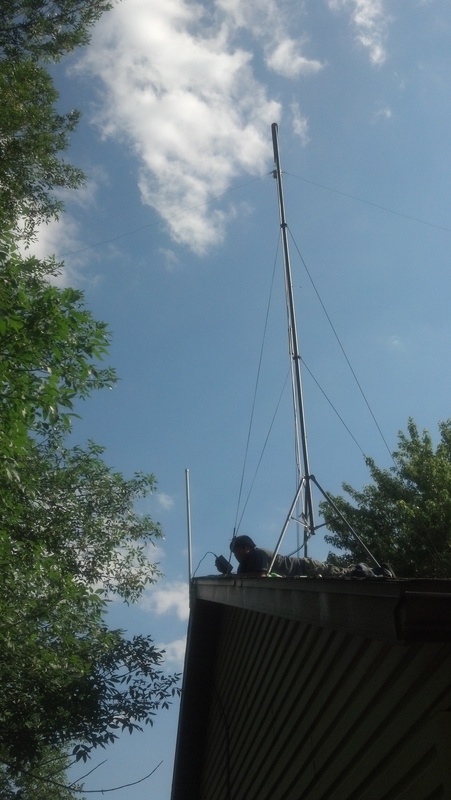 Testing SWR: Make sure you hoist your antenna all the way up before testing its performance. I tried testing my antenna before climbing up on the roof — my son held the mast upright and I tied the legs of the antenna off as high as I could to nearby trees, but the SWR was just too high on 40 meters due to the proximity of the antenna to the ground. Throwing lines: If you have trouble throwing a line, try a heavier weight at the end. I now know that throwing lines is an art. At various points in this project I experimented with a sling-shot, potato-gun, and throwing by hand. Each of these techniques has its place. At one point the best way for us to get a line where we wanted it to go was by simply whirling a weight and letting it fly — but only after we figured out that we needed a good heavy weight at the end. At first I used just a few ounces of metal, but it kept getting hung up in the branches we were penetrating. Once we switched to a pop bottle full of water, it worked on the first try. No doubt some of these lessons I’ve only partially learned (and maybe some of them I haven’t learned well at all). If you have any better suggestions, or if you have some of your own hard-won lessons you’d like to add, fire away. If we can learn from each other here, maybe we won’t have to learn quite as many lessons the hard way!